Jared, and all the staff at Twin Cities Appliance, have been great! Our oven had an unusual manufacturing problem, and the folks at Twin Cities Appliance have been great about dealing with it. They stayed in touch, have a great system to keep me posted about repair dates, and arrival times. All have been courteous, and professional on the job, and on the phone. 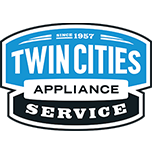 I would highly recommend Twin Cities Appliance! Andy cleaned up after Jay. When Jay left I mentioned that the loud pounding noise was an issue. Jay said it was fine. It was not! Andy came twice to order a new part and then install it. Thank goodness for Andy!! We had an out-of-the-ordinary repair situation. Twin Cities Appliance repair was phenomenal about staying on top of it, answering questions, and following up. Very happy! Grateful for the excellent service! I was very happy with the service, and service technician. He was very personable plus he showed genuine interest in answering my questions, which was greatly appreciated! Mike Thayer is a skilled, competent technician. Great work - thank you! A timely and proficient service team. DISHWASHER WHIRLPOOL KDTE254ESS1 "Install all parts checked over unit tested out good, ran diagnostics went thr fine.."
REFRIGERATOR KITCHEN AID KRFF507ESS00 Found unit not running and warm in both compartments warm. Ran svc testes. UI not reading thermistors. Ran svc test on sealed system. UI goes through steps but main board not responding. Needs main control. Quoted cust W10807590 control $265.64 and $85.90 for labor. Cust wants to think about repair. Advised cust svc call good for 30 days. Advised cust to contact office if they decide to repair. Collected for svc call. DOUBLE OVEN KITCHENAID KODC304EWH00 Pulled unit out on cart. Pulled rear cover. Found harness disconnected. Connected harness and tested. DOUBLE OVEN KITCHENAID KODC304EWH00 Installed parts. Reinstalled oven. Tested machine. DISHWASHER KITCHEN AID KUDS01FKPA1 "Filling and draining ok, when pump turns on just hums, pump seized up needs to be replaced, needs link kit installed as well, 135.95 for labor , customer to think about repair, ESTIMATEONLY DONOTORDERPARTS ; ordrng 1 8194001 (LINK) and 1 DONOTORDERPARTS and 1 W10782773 (pump&motor)"
DISHWASHER KITCHENAID KDTM804EBS0 "Unit leaking down through sump motor assembly. Installed new sump/motor and tested, all ops good, no leaks"
WASHER MAYTAG MVWB835DW0 "Washer ,,,,,checked washer operation..ran washer and checked water ..filling and water level ...water level is all normall and agatation is good ,checked basket and outer tub ,..no soap residue anywhere and basket checked ok ,no sharp edges on washplate and basket ,,all working normall operation on washer ..instruct customer on detergent use and loading of clothes ,recalibrated control board to reset .."
DISHWASHER KITCHENAID KDTM804EBS0 "Found lower gear missing on new sump, lower arm not connecting correctly, need to swap white gear over to new sump, need to reorder sump and replace lower arm as well; ordrng 1 W10860176 (arm-spray) and 1 W10861526 (pump&motor)"
WASHER MAYTAG MVWB835DW0 "Washer ....checked washer operation ,,, ran washer and tested operation ...no error codes in control .checked water filling on hot and cold ,filling good ,water levelis all good and normall .no soap residue in basket ,,and no sharp adages anywhere ,,washer is working good all normall operation .instruct customer on detergent use and only use 1 or 2 teablespons soap .and use deep water ,,wash to help ..customer complaining about holes in clothes ,but nothing found causing it ,all working normall ..called test line to document file 7724331218"
DOUBLE OVEN KITCHENAID KODC304EWH00 "unit on rug in kitchen upon arrival, turned off breaker, fuse installed before different than new fuse needed to modify harness to accept new fuse, Replaced lower tstat and fuse, also found upper tstat open, turned breaker on unit doors unlocked now, just need to replace upper oven tstat and set up for 2 guys to put unit back into cabinet , gasket sent out is for blower fan not ui, doesn’t look like gasket on ui in parts list , she will call in to schedule; ordrng 1 2MANJOB and 1 W11034459 (TSTAT)"
DISHWASHER KITCHENAID KDTM804EBS0 "Found arm manifold not pushed into sump all the way upon installing new arm, ran diagnostics through ok, no leaks all functions ok, sounds normal"
OVEN KITCHEN-AID KEMC308KSS01 "Torsion springs in microwave door broke. Out of stock on truck, ordering to cust. Cust paid in full; ordrng 1 WP4452395 (SPRING) and 1 WP4452396 (SPRING)"
REFRIGERATOR KITCHENAID KUDF204ESB00 Check under the counter drawer fridge for issue with icemaker not working and found that fill tube to icemaker had frozen closed during construction of kitchen. Clear tube and cycle icemaker and verify mold now fills with Walter. Customer will monitor over the weekend. OVEN KITCHENAID KODC304EWH00 Installed parts. Tested oven. WASHER MAYTAG MHW8200FC0 "Washer ..checked washer operation .checked detergent and fabric dispenser operation .took dispenser out and cleaned dispenser top and dispenser itself ..instruct customer on dispenser operation ,carefully do not over fill cup on dispenser ,fabric softener is now staying in fine ,under warranty ,,closing date on house for use 1-19 -2018"
RANGE KITCHEN AID KERS303BSS0 "Pulled unit out on rug and towel and installed new wiring harness and bake element. Tested unit, elements all working normally. Ran bake cycle to 350, heated normally. Cust inlaws were there, he is at the hospital with a sick newborn but i spoke to him and he said he will call in to office. Unit has had multiple issues, he was going to call Whirlpool but has not had the chance"
OVEN WHIRLPOOL WOD51EC0AS05 "Installed new door seal on upper oven and both hinges on upper door. Remounted door and tested, dor sealing better, no gaps along seal, door switch closing properly. Cust will monitor"
RANGE KITCHEN AID KERS303BSS0 "Oven not heating all the way up. Entered diagnostics, no errors. Ran bake element, not coming on. Pulled unit out, found bake element burned at end and main harness and connector burned up. Unit needs new bake element and new main harness. Per office told cust we would waive trip charge, he would only pay for harness and for difference in labor between replacing a control and doing a harness, 50.00 for labor plus 91.22 for the harness. Cust not unhappy with us but is going to call Whirlpool to see if the6 will cover anything, in meantime i left the bake element at cust home and am ordering the harness to cust. Will keep the control and return after call completed if not needed; ordrng 1 W10349717 (HARNESS MAIN)"
REFRIGERATOR WHIRLPOOL WRF757SDEM01 Check fridge over for same issue with fresh food evaporator frozen over and blocking air flow. Test defrost thermistor and passed in diagnostics. Clear all ice and remount cover assembly and seal around edge of evaporator cover with tape per new instructions from factory tech line . Office will need to collect from customer do to no one home at time of repair. Customer will need to throw out food that might have spoiled during warmer conditions. OVEN WHIRLPOOL WOD51EC0AS05 "Cust said sometimes when using both ovens the control will completely blank out for a couple seconds then come back on showing 12.00, whatever cycles she is in will not resume. Entered diagnostics and checked for errors, no errors. Checked heating, all normal. Checked cooling fans, bo5h running and getting steady airflow out bottom vent. Checked doors and seals and found upper oven door not closing all the way, not pressing tightly enough to the seal, allowing heat to escape out top of door directly under the control panel. Ordering new door hinges and door gasket. Left card with cust, they will call in for reschedule; ordrng 2 W10825778 (HINGE)s and 1 WPW10282960 (DOOR GASKET)"
REFRIGERATOR JENN-AIR JUD24FCECX00 Check under counter fridge over for complaint of bottom drawer icemaker bail arm hitting against back of drawer and occasionally pops the bail arm out of the socket on the icemaker module. Reinstalled bail arm into slot and test drawer and verify icemaker is working properly per design and customer has to be careful when opening and closing or are can get caught and pop out . Called tech line and spoke with Andrew and verified there is no other option or updates for haul this drawer works with ice maker design. Could not document with Tech line due to the system being down. REFRIGERATOR KITCHENAID KRSF505ESS01 "Cust concerned something was wrong with ice dispenser motor and icemaker, noise levels were greater than on her old unit. I ran dispenser and cycled icemaker, noise levels normal for this model. Explained that changes in component parts made for different sounds during operation. All ops good"